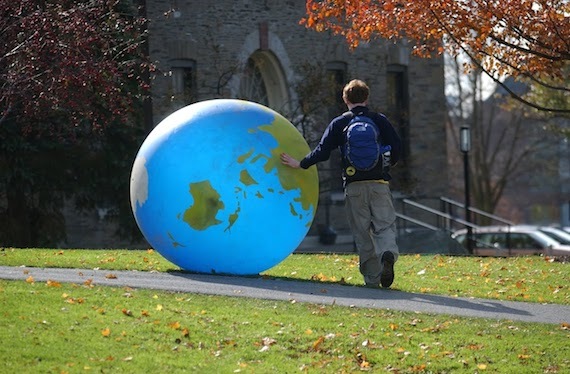 Colgate University has been recognized as a top performer in the 2018 Sustainable Campus Index by the Association for the Advancement of Sustainability in Higher Education (AASHE). Innovative and forward-thinking initiatives, such as Colgate’s comprehensive wellness program, Chapel House geothermal exchange system, and continued improvements to preserve campus-owned forested land, played integral roles in achieving Colgate’s new Sustainability Tracking, Assessment & Rating System (STARS) rating from AASHE. STARS is a transparent self-reporting framework for colleges and universities to measure their sustainability performance. The full STARS report, informed in part by student research, can be found here. The 2018 index places Colgate sixth as an overall top performer among baccalaureate institutions, and earned Gold recognition. “AASHE STARS is the gold standard for assessing sustainability programs in higher ed,” said Colgate Director of Sustainability John Pumilio. “The fact that we scored so high and achieved a Gold rating illustrates a commitment to sustainability from every level of the institution.”. Colgate also ranked 10th for air and climate, which highlights measures to assess and reduce greenhouse gas emissions; tied for seventh in purchasing, which includes sustainable purchasing policies, life cycle cost analysis, and the purchase of electronics, paper and cleaning products; and tied for fourth in water conservation. The AASHE report demonstrates that campus sustainability relies on more than just the work of one office. Rather, it depends on other student, staff, and faculty champions across the institution dedicating themselves to creating a more socially and environmentally responsible, resilient community as Colgate works toward carbon neutrality in 2019. “I am really proud of the work Colgate is doing toward integrating sustainability across the university, and it is wonderful that this work is recognized by the AASHE STARS program,” said Associate Professor of Biology and Environmental Studies Catherine Cardelús, who is chair of the Colgate Sustainability Council.